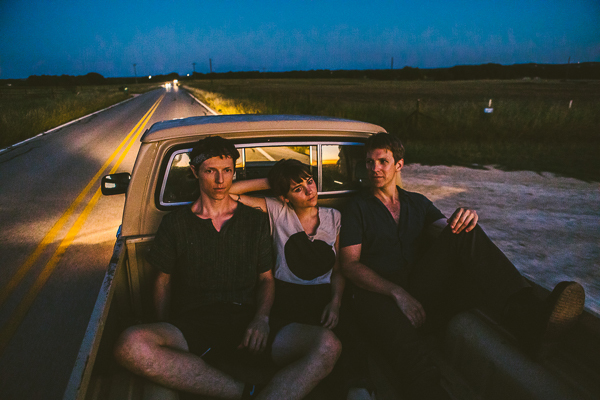 Loma, the project comprised of Jonathan Meiburg, best known as the singer of Shearwater, and Emily Cross and Dan Duszynski of Cross Record, released their self-titled debut album via Sub Pop in February. As they prepare for their first ever tour of the UK, they have shared a new video for ‘White Glass’. The spark that led to Loma’s creation occurred in 2016 during a European tour in which Cross Record, opened for Shearwater. After an especially memorable show in Belgium, Meiburg approached Cross and Duszynski about working together. 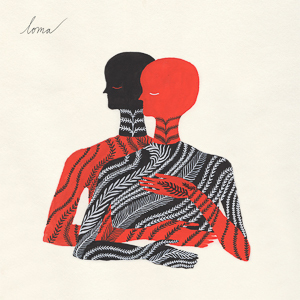 Two years later, their collaborative project, Loma, has released a debut album, and the trio is already deep into a tour spanning three months and twelve countries. For more information on tickets please visit lomatheband.com. Loma’s acclaimed, self-titled debut is out today everywhere on Sub Pop. Listen to the album now at Spotify / Apple Music / Bandcamp / YouTube then trade yr dollars for it here or in yr friendly neighborhood record store. After presenting singles “Black Willow” and “Relay Runner,” Loma shares the first song the trio wrote and recorded together, “Joy,” a song about the giddy, terrifying experience of falling in love, especially against your better judgment. Of that initial session, Meiburg noted “There was something special about the combination of the three of us, and very different from either of our bands. But I think we were afraid to say so out loud, for fear of jinxing it. I remember the hairs on the back of my neck standing up when Emily hit that high, screaming note on the clarinet on ‘Joy’; it sounded like a human voice.” That sense of discovery, stoked by the album’s urgent and searching lyrical themes, is felt throughout the entirety of Loma and extends to the listener. Loma is available for preorder from Sub Pop right here. North American preorders of the limited Loser edition from megamart.subpop.com will be available on clear vinyl with red and black swirlies (while supplies last). A new T-shirt design will also be available. MA: You know, I have to admit I miss not knowing who was calling when the phone rang. I like clinging to the fiction that I don’t know who it is. JM: It’s true. “Hello” really used to be a question. It’s strange to remember that time so clearly, since it already seems so far away! The other day, I saw a list of New Year’s resolutions David Bowie published in 1980—one, by the way, was his intention to be 67 years old by 1990. MA: I happen to be pretty good at arithmetic and I could have told him that wasn’t going to happen. JM:—but the one that really struck me was “to own a print of Eraserhead.” Not so much because it’s Eraserhead, but because the idea of owning a personal copy of a cult film, that you could watch anytime you wanted, still seemed extravagant then. Even for someone who liked being ahead of his time. MA: He was on Broadway back then, wasn’t he, playing the Elephant Man? That would have been about the time Scary Monsters came out, I guess. JM: You were living in New York then? MA: Yes. It was a hairier place then, but it was also a great time for New York music. I’m not saying that out of nostalgia, by the way—I think now’s a great time for New York music too. But it was just different then. Now there’s this idea that punk was the only ‘real’ thing happening then, the CBGB thing, or No Wave—and that was exciting, it was great—but there were all kinds of other musical avenues opening up too, around then. I’m thinking about how in the summers there were these great, sort of viral hits you’d hear all over the place, booming out of cars and boomboxes and bodegas, and some of them were really rough and ready, homemade things. Like Frankie Smith’s “Double Dutch Bus”—you ever hear that one? JM: Speaking of “Buffalo Gals” and double dutch—I was listening to McLaren’s “Double Dutch” the other day and was blown away by what a wild mashup that song is. The Mahotella Queens, the disco strings, the handclaps, the rope-whooshing sounds, and Malcolm sort of awkwardly sing-talking his way over the top of it with total, oblivious confidence. MA: Confidence will get you everywhere. JM: It’s got a great video, too. I like it better than Graceland. MA: Me too. Hey, aren’t we supposed to be talking about your record? JM: Ha, yes! But I think the early 1980s are a good place to start from, in a way. When I was writing the songs I was listening to a lot of records from around that time—like Scary Monsters, which you mentioned, or My Life In the Bush of Ghosts, or Big Science, or Peter Gabriel’s Melt record, or PiL’s Metal Box. MA: I definitely heard all those in this record—also Remain in Light and Talk Talk’s The Colour of Spring. But no offense, I don’t actually hear any Metal Box. JM: Danny wasn’t going to let me go there, which is probably a good thing. That’s such a mesmerizing album though. I snuck in a lyrical nod to it in one of the songs. MA: Maybe that’s part of what I like about your record. It’s certainly not a period re-creation, but it has a resonance, for me, with that time. It looks back, but it also looks forward. MA: When it was broadcast! Back then you had to be paying attention or you missed everything. But why that time? Why those records? It’s not like nostalgia for your teenage years. More like nostalgia for my teenage years. JM: Well—I like thinking about what the sounds of that time must have meant in context. They definitely give me the sense of being at a crossroads, of a revolution brewing just offstage, and I think that’s at least in part because digital recording gear was just starting to hit its stride: Eventide harmonizers, Linn drums, early samplers and delays—stuff that must have seemed like the coastline of an exciting new world, inhabited by new species of music. But MIDI hadn’t reared its head yet, or some of the other gadgets that started to make everything so crispy and mechanical-sounding a few years later. You still needed to have musicians who could play, and listen. Is any of this actually true, by the way, or am I just projecting? MA: It’s funny, because I was just thinking that at the time lots of people were saying that the stuff you’re talking about meant that musicians didn’t have to listen or know how to play. Now they say that about laptop music. Plus ça change… but I take it that the technology you’re talking about played an important role in Jet Plane and Oxbow? JM: Danny, who I mentioned, Danny Reisch, produced and engineered the record. We’ve worked together for the past couple of years—he also played drums on our tours—and we’ve gotten really dialed in to each other’s strengths and flaws, so there’s a lot we don’t need to explain to each other. But we started this record by setting some ground rules, and one of them was to lean as much as we could on instruments and gear from that era, as long we didn’t veer off into pastiche. JM: Believe me, I was skeptical, too—but it turns out they can be great with the right drummer, especially if you put fiber-skin heads on them and not those plastic ones they come with. I also mostly played a strat this time instead of the older hollow-body I used on the last few albums, and I fell in love with a beautiful little synth called a Korg Lambda; it’s the first sound you hear on the record. We also spent some time doing overdubs and treatments with Brian Reitzell in LA. He mostly does film scores, but also he used to play drums for Air and Redd Kross. MA: Now, that’s what I call a versatile drummer. JM: I think he enjoyed working on something that wasn’t tracked to picture. But he reveres that era of recording we’re talking about, and a bit further back, too; he got me into Takemitsu and that mind-bending Tangerine Dream record Zeit. With Brian, we were trying to nudge the record toward that world, toward that kind of beauty, and menace. MA: ‘Menace’ is an apt word. There was certainly a lot of it in the air in 1980. Carter reinstated the draft, Reagan got elected, John Lennon got shot, and New York City was a pretty scary place. Everybody thought Reagan was going to start World War III. Did you know where the fallout shelter was in your school? JM: I did. And thinking back, I guess Baltimore would have been vaporized along with DC if the Soviets nuked us, so the end would have been quick for my first-grade class, no matter where we cowered in the building! But I also think of it as a time—I mean, these are really early memories, but they’re deeply embedded—I remember a feeling that technology was about to change everything about life as we knew it. Voyager was sending back pictures of Jupiter and Saturn. The Empire Strikes Back was in the theaters, and then E.T. made all my friends want a Speak and Spell. We were fascinated by computers, but we didn’t really know what they were, so they seemed capable of anything. Remember Superman III, where Richard Pryor builds an evil computer that wants to destroy the world? MA: In retrospect, that’s a visionary film about cyber-terrorism. Now computers actually are capable of anything. JM: Yeah—Bowie could stick a few hi-res copies of Eraserhead on a thumb drive and toss it in his sock drawer. But maybe what appeals to me most about looking back to that era is that I feel like we’re in a parallel time now. Technology seems magical again in the way it did when I was a little kid, but it’s also scarier than ever. People can tinker with the actual DNA of living things. The NSA can watch drone feeds of your house on their lunch breaks. Soldiers in the Nevada desert can kill people on the other side of the world by pressing a button. It’s hard to tell where legitimate concern ends and paranoia begins. MA: And legitimate concerns are routinely denounced as paranoia. You’re right about the parallels with this time—for instance, the Russians are making an encore performance as international heavies. And as far as technology goes—have you seen the promos for that Soylent stuff? JM: “What if you never had to worry about food again”? MA: I see things like that and I think: we are doomed. JM: Why are we laughing about this? I know! I guess sometimes the truth is like a hit of oxygen, or maybe nitrous, even when it’s grim. But that’s just the backdrop to life; it’s our fantasies that show you who we really are. I remember watching the Baltimore Aquarium being built back when I was a kid, this giant, earthbound space station of concrete and neon and glass, full of escalators and dark passageways and glowing fish, and the shining pyramid on top with a rain forest in it, and thinking this is the future! I was so excited about growing up in that future, you know? MA: Now it’s yesterday’s future. JM: Just like today’s will be tomorrow. Did you ever see Arthur Russell perform, by the way? MA: No. It was just as possible to miss great stuff then as it is now. JM: Are you saying that to make me feel better? MA: Maybe! My guess is fewer people will miss this record than you might think. Speaking for myself, I don’t think I’ve ever heard you sound so extroverted—I can see you singing these songs to stadiums full of people, with one foot up on the monitor. JM: Is that a good thing? JM: I think I have to make peace with that word. As long as it means “the record offers you a sonic landscape that rewards repeat listens”, which is something I’m always striving for, I’m OK with it. This one definitely has some of my proudest recorded moments, like that solo at the end of “Filaments”. MA: What is that, by the way? JM: It’s a guitar. I promise! MA: It’s very Adrian Belew. Of all these songs, “Quiet Americans” sounds most like a hit to me, or your version of a hit, more than any other Shearwater song I’ve heard. It’s hard for me to get it out of my head. And I think I know what it means, but what does it mean to you? JM: My idea for Jet Plane and Oxbow was to try to make a protest record that wasn’t dumb or preachy. Which was sometimes hard to reconcile with how much fun it was to do! But the more grand or triumphant the songs sounded, the more conflicted the lyrics became, which I really liked. I listened to it the other day for the first time since we mastered it and it reminded me of a breakup letter—the kind that’s furious and tender at the same time, because it’s written with love. MA: Wow, who are you breaking up with? JM: Good question…the United States, I guess, though that sounds ridiculous when I say it out loud. Maybe the idea of the United States. Some of the things we like to tell ourselves about ourselves. I’m as guilty of that as the next person, by the way; I’m not saying I’m the guy who sees it all clearly. I don’t know if anybody really can. MA [in his best Bowie]: “I’m afraid of Americans!” But it can’t really be a breakup, can it? Because in a breakup you walk away, and you’re not leaving… are you? JM: That’s the thing. I can’t stop being an American, even when it makes my skin crawl. I also can’t help loving it here, even though I hate it sometimes, too. And I don’t think I’m the only one here who feels like this. So in the end, I guess, the record felt like a way for me to send out a little beacon that just says “You’re not alone.” In the tense, polarized, tech-addled—but still very beautiful—world we’re in, I don’t think anyone can hear that enough. Listen to single “Quiet Americans,” and preorder Shearwater’s upcoming Jet Plane and Oxbow right over here.